Are you set to join the Millionaire’s Club? Click here to play! There is a single spot open for a player of your calibre, so step up to the challenge and spin, spin, spin! With any luck you’ll be spinning up big and on your way to monetary success. 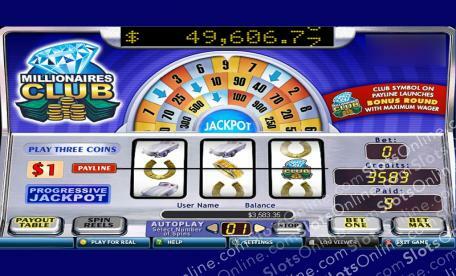 Millionaire’s Club is a lucrative 3-reel game (a 5-reel version is also available) that is played across a single pay line. That means that every winning combo you spin up will pay out! Wilds, Scatters, and Bonus Rounds aren’t necessary at the Millionaire’s Club, as every symbol pays out extremely well. Bracelets, Cars, Boats, and Watches will be lining your pockets with expensive coin in no time, but if you are looking for the biggest jackpots around, then try your hand at the Diamonds. Depending on how many coins you play, you can win up to 1,500 times your initial stake for the best Diamond combination. Play at the Millionaire’s Club today, and walk away a massive winner!